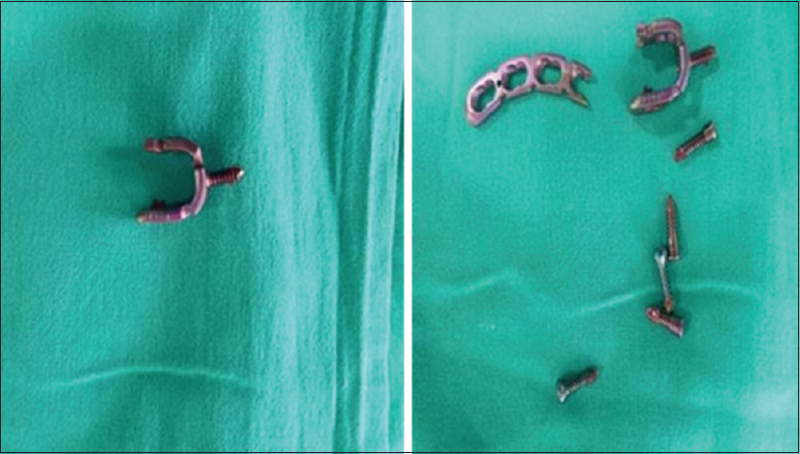 The advent of locking plates has brought new problems in implant removal. Difficulty in removing screws from a locking plate is well known. These difficulties include cold welding between the screw head and locking screw hole, stripping of the recess of the screw head for the screwdriver, and cross-threading between threads in the screw head and screw hole., Several reports described risks, tips, and techniques to remove these locking plates., These include using a conical extraction screw, cutting the plate, using high-speed carbide drill bits and burrs to remove the screw heads, and removing the shanks with conical extraction screws. However, there are cases in which removal is extremely difficult if an instrument set for round screw removal is not available. We described a technique which allowed us to easily remove such round-headed, cold-welded jammed screw with simple instruments at hand and complete the prescribed operation smoothly [Figure 1] and [Figure 2]. A 32-year-old female patient reported to us with broken clavicle plate, who was operated 3 years back from outside for fracture clavicle right side. Now, the patient came with a complaint of pain and deformity in the right clavicle region for 3 months following lifting heavy weight. 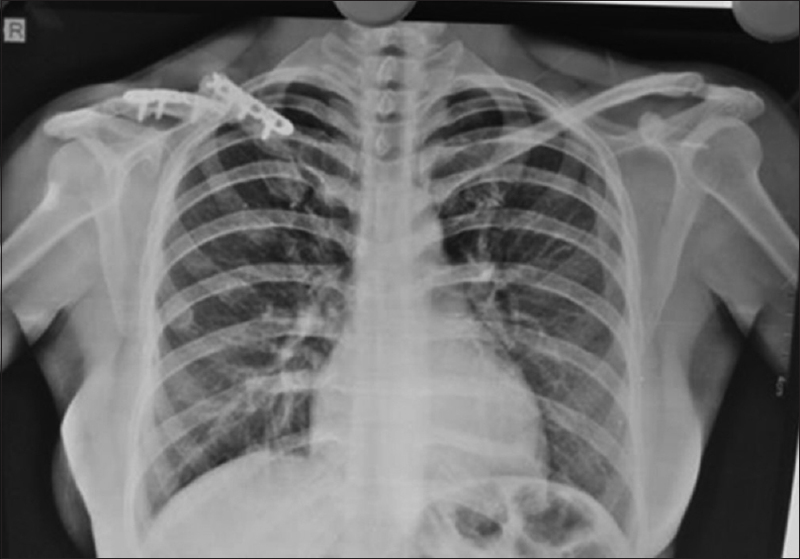 X-ray was suggestive of broken implant with nonunion of clavicle. 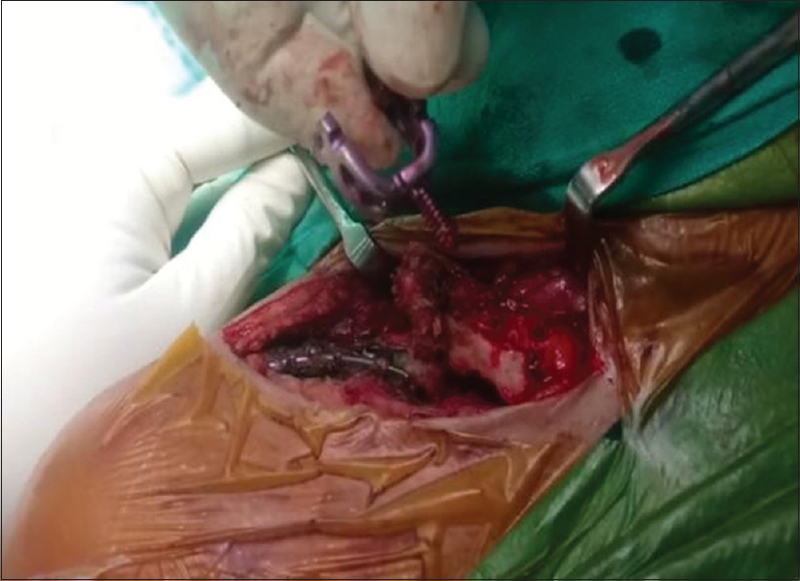 The patient consented to implant removal, freshening of edges, and fixation with anatomical clavicle plate with bone grafting, with the express understanding that implant removal might be impossible. All the screws are removed with standard screw driver except the second screw of medial broken plate which was jammed and round headed. The carbide drill was not available at that time. We bent both ends of broken medial plate around screw and removed screw by just rotating bent plate anticlockwise. Fracture ends were freshened and fixation was done with anatomical clavicle locking plate and bone grafting. At the end of the procedure, surgical wound was washed thoroughly with normal saline [Figure 3], [Figure 4], [Figure 5], [Figure 6]. 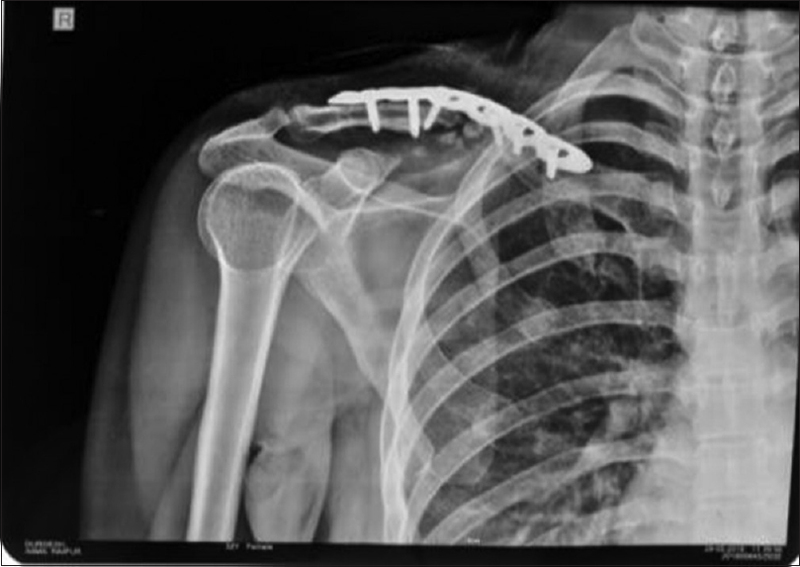 Implant removal following broken implant in clavicle fracture is considered for pain related to metalwork, impingement, nerve injury, and patient-requested implant removal. Removing implants is often more difficult than the index operation to insert the implant. Risks of implant removal include wound-healing problems, soft-tissue injury, and neurovascular injury, failure to remove all of the implant, and refracture. Difficulties in removing a titanium locking screw include jammed screws, damage to the recess in the screw head (stripping) for the screwdriver, and broken screws. Tips, techniques, and pitfalls of implant removal are well described. Instruments including conical extraction screws, hollow reamers, extraction bolts, modular devices, and carbide drill bits have been described in the methods used for removing locking screws., The generally accepted reason for titanium locking screws getting jammed in the threaded screw holes is cold welding of the screw head in the threads of the locking screw holes., We believe failure to remove the screws directly with the conical extraction screw was attributable to the following factors: (1) jamming of the screw head in the locking screw hole, owing to cross-threading and not necessarily cold welding, (2) grip of the screw threads in the far cortex, (3) bony growth over the titanium screw at the far cortex, and (4) as the conical extraction screw was inserted, the screw head jammed farther in the screw hole by expanding the screw head. Risk of cold welding in titanium plates and screws should be low if the screws have been inserted in an orthogonal fashion to the plate with a torque-limiting screwdriver. Even if a cold weld spot was present, our technique is less destructive when compared with cutting the whole plate or screw and over drilling the screws. A locking screw that cannot be removed with a torque-limiting screw is technically jammed whether it is attributable to cold welding or cross-threading or just overtightened. 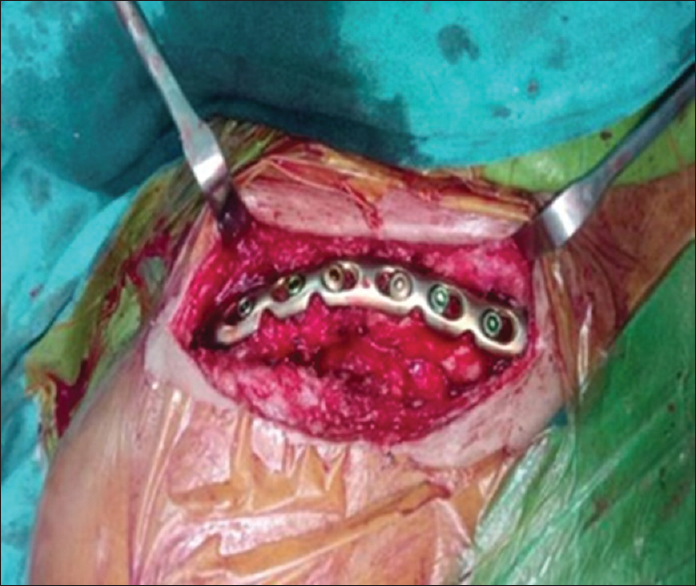 Bony overgrowth is a substantial problem in titanium implants., There is always the danger of thermal bone necrosis or iatrogenic bony injury when using high-speed burrs. However, our technique is less destructive as it produces very less heat as compared to other techniques because it is not mechanical but a manual procedure. It is essential to have all the appropriate implant removal instruments, including carbide drill bits and high-speed burrs, and prepare for a long procedure. A conical extraction screw is not always successful in removing the jammed screw. The risks of high-speed burrs are high local temperature and metal debris. As with any problem, prevention is the best treatment. All precautions should be taken to ensure that the locking screws are inserted perpendicular to the plate without cross-threading using a torque-limiting screw driver. The problem of screw head jamming is not seen with stainless steel screws. Osteoporotic bone is a limitation of the above method as the bone is weak and may break while bending the plate and is possible only with a single locking screw. This technique is very quick, easy to perform, and inexpensive without the use of plate cutting blade, burr, hollow reamer, and other instrumentation. It is very effective technique to remove the stripped headed, cold-welded jammed locking screws. It is also very less destructive because of no heat production during the procedure. There is no problem of thermal necrosis to the bone or the surrounding soft tissue. It is an inexpensive and effective method for the removal of such implants, which are extremely difficult because of round-headed cold welding and jammed locking screw heads. Ehlinger M, Adam P, Simon P, Bonnomet F. Technical difficulties in hardware removal in titanium compression plates with locking screws. Orthop Traumatol Surg Res 2009;95:373-6. Cole PA, Zlowodzki M, Kregor PJ. Treatment of proximal tibia fractures using the less invasive stabilization system: Surgical experience and early clinical results in 77 fractures. J Orthop Trauma 2004;18:528-35. Georgiadis GM, Gove NK, Smith AD, Rodway IP. 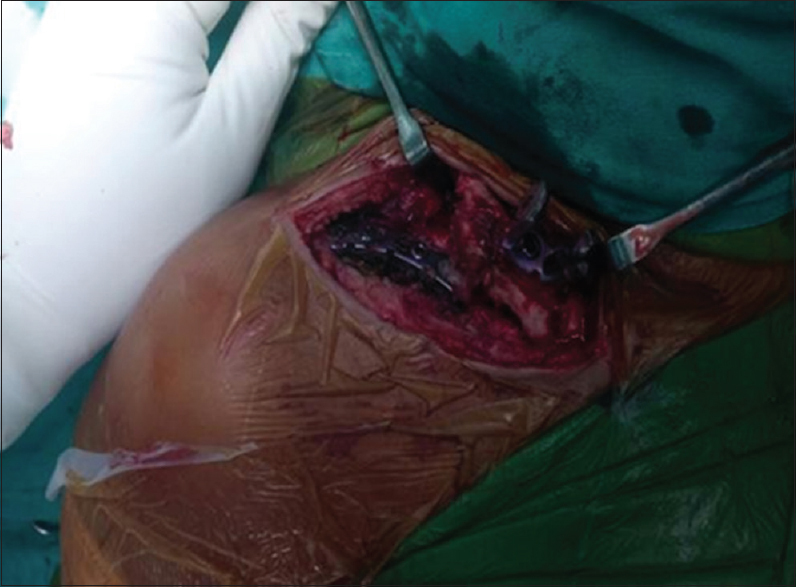 Removal of the less invasive stabilization system. J Orthop Trauma 2004;18:562-4. Hamilton P, Doig S, Williamson O. Technical difficulty of metal removal after LISS plating. Injury 2004;35:626-8. Hak DJ, McElvany M. Removal of broken hardware. J Am Acad Orthop Surg 2008;16:113-20. Bae JH, Oh JK, Oh CW, Hur CR. Technical difficulties of removal of locking screw after locking compression plating. Arch Orthop Trauma Surg 2009;129:91-5. Sanderson PL, Ryan W, Turner PG. Complications of metalwork removal. Injury 1992;23:29-30. Jago ER, Hindley CJ. The removal of metalwork in children. Injury 1998;29:439-41. Takakuwa M, Funakoshi M, Ishizaki K, Aono T, Hamaguchi H. Fracture on removal of the ACE tibial nail. J Bone Joint Surg Br 1997;79:444-5. Hayes JS, Seidenglanz U, Pearce AI, Pearce SG, Archer CW, Richards RG, et al. Surface polishing positively influences ease of plate and screw removal. Eur Cell Mater 2010;19:117-26.